Slow roasted pork belly with Asian basting sauce. So delicious. Mix the dry ingredients with the butter then rub them onto the belly slices and onion. Place in oven at 150 °C for 20 minutes then baste and repeat until total cooking time (60 achieved). 3 members have added this recipe to their cookbook. A healthy, baked, delicious banana treat. Aubergine and goats cheese bake. 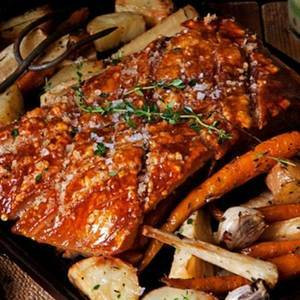 There are 572 calories in 1 serving of Slow Roasted Pork Belly with Asian Basting. Calorie Breakdown: 81% fat, 4% carbs, 15% prot.